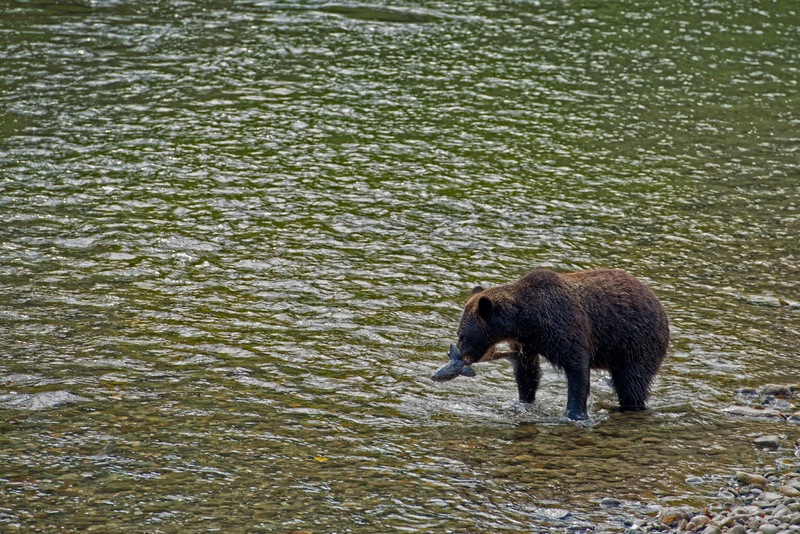 In September, the area around Bella Coola BC, has an onslaught of Grizzly Bears catching the parade of salmon swimming upstream to breed before dying. The Grizzlies are trying to put on as much weight as possible to survive the oncoming winter. The salmon and the bears are so plenty you may see a few bears at once eating only the extra rich salmon eggs and throwing the rest of the fish away. We made a special trip into the BC wilderness to capture this phenomenon. The bears are so intent on the task at hand that the humans wielding cameras at them are not even a small curiosity to them. I love this shot of the Grizzly eating his salmon because of the minimalist quality of the dark shape against the green water. I used a few photoshop techniques to bring out the details in the water ripples and the course fur.